Did Apple acquire the company partially responsible for the sizzling fast Hummingbird chip? We recently told you that the Samsung Galaxy S would have the fastest GPU chip of any Android device. We mentioned that the new Hummingbird A8 chip was responsible for the speed and even though it runs at the same 1GHz as Qualcomm's Snapdragon, the Hummingbird can help the Galaxy S process 90 million triangles per second which is 3 times faster than what the fastest Snapdragon equipped Android model can process. Now there is strong evidence that the company partially responsible for the Hummingbird-Intrinsity-has been acquired by Apple. Back in July, we reported that Samsung had introduced the 1GHz Hummingbird processor, calling it the fastest cellphone CPU to date. Working with the Korean based manufacturer was Intrinsity. The Hummingbird is based on ARM Cortex-A8 architecture and is the same platform used by handsets like the iPhone 3GS, the Palm Pre and the Motorola DROID although at slower speeds. With Apple expected to rely on ARM architecture for many of its mobile products, when word came out recently that Intrinsity had been acquired, the first suspect was Apple. 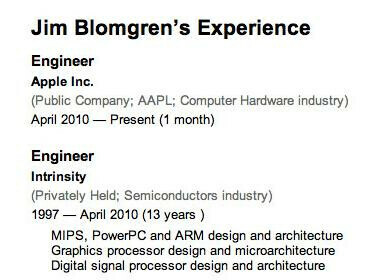 MacRumors took a look at the LinkedIn pages of some Intrinsity employees and found that some had been listing Apple as their current employer. Actually, there had been 13 Intrinsity employees listed as now working for Apple. While it seems likely that Apple did buy the company, it also could be that they simply have hired some key people. LinkedIn has since removed the listings of the 13 Apple employees in question but has kept the postings of Mark Nodine. Nodine is one of three founders of Exponential Technology, a company who lost some of their talent to start up Intrinsity. And guess what company Nodine's listing shows he works for? Apple. Regardless of how all the pieces fit, it looks like the gang at Cupertino is feeling the need for speed in some of their upcoming launches.